Innovation is very important in Aachen already over a century ago. At the foundation of the RWTH Aachen University in 1870 the first Chair of Electrical Engineering was established. Since 2005, you can find also CanControls in the imperial city. 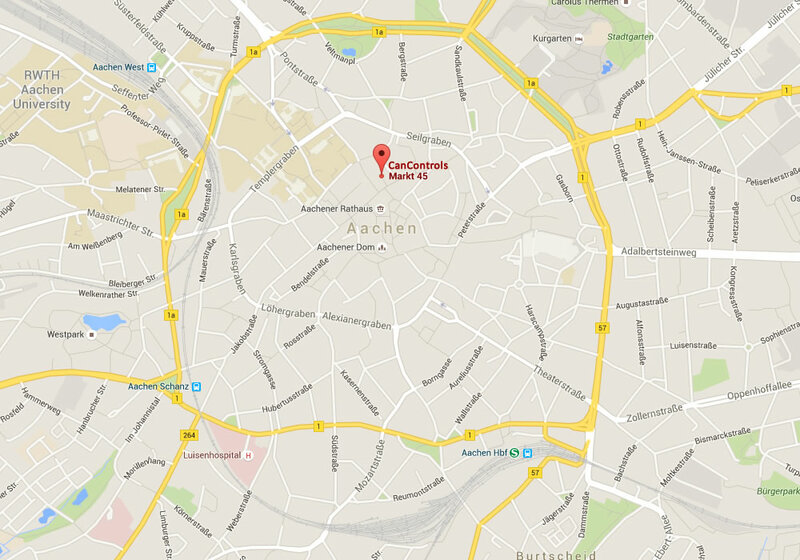 Our office is located in the heart of Aachen, directly vis-a-vis of the historic town hall and market. You can reach us easily by car or public transport. If you have time just enjoy a coffee in one café around the marketplace or watch Aachen historic old town and the world-renowned cathedral. Whether your are coming on the E 314, the E 40, the A4 or the A44 to Aachen – you can reach us in less than 10 minutes from Aachen highway exits! Note that large areas of the city are pedestrian areas and are locked for car traffic. Right next to our office there is the parking garage Rathaus (Mostardstr.5, 52066 Aachen – please enter also the address as destination in your navigation system). Aachen is linked to the international railway network. From the bus stop in the forecourt of Aachen main astation run regularly every few minutes the bus lines 11, 14, 21, 44 and SB 63 for Elisenbrunnen and vice versa. It will take about 5 minutes for the walking distance Elisenbrunnen to our office. For a small walk from the main station to us you will need about 15 minutes. No matter what questions you have about our products and services, do not hesitate to contact us. We are happy to handle your request.